Lock in a great price for Relais Villa Grazianella – rated 9.5 by recent guests! What’s not to love. This is true Tuscany. Gorgeous property. Amazing Tuscan cuisine. Great service. All the love for this place. The staff was outstanding. Everyone had a wonderful smile and was so helpful. The rooms were spacious with wonderful views. The pool was great and so clean. We rode the e-bikes for €25 for a half day and it was well worth the money. One of our favorite parts of the stay! And the food!!! It was amazing. We enjoyed this stay so much!! Thank you! Views were something from a fairy tale. Vineyards were immaculately kept. The staff was more welcoming than anything I had previously experienced. 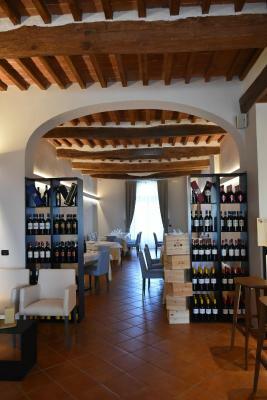 There aren't enough kind words to say about our experience at Relais Villa Grazianella. Everything from check-in to our room to our dinner to our wine tour was absolutely amazing. The staff were so kind and helpful and you can tell that they really love what they do and really care for their guests. I will absolutely stay here again and again. The location is perfect to get to so many wineries, ample parking for the guests and what was even more incredible was the fact that it was off the beaten path just enough to feel like you're secluded...but yet you're not. The chef even prepared a special dessert for my wife's 40th birthday dinner and played the "Happy Birthday" song all over the lobby and really made our experience special. Our entire stay was wonderful and we can't wait to go back! The food and wine were both excellent, but the hospitality was even better! The staff were all friendly and they had good senses of humor. The location was stunningly beautiful. The meal at their restaurant was excellent. The breakfast was very good. Great location. Close to montepulcianio. Beautiful property and accommodations. I will definitely be back next trip. 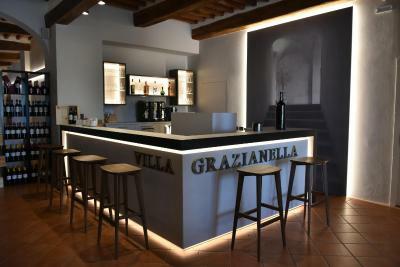 One of our top picks in Acquaviva.Part of a wine farm producing Vino Nobile Di Montepulciano, Villa Grazianella was built in the 17th century. The outdoor swimming pool overlooks the olive groves and vineyards of Tuscany. Relais Villa Grazianella offers rooms with exposed wooden ceiling beams, equipped with air conditioning and private bathrooms. All rooms enjoy relaxing countryside views. Villa Grazianella Relais offers free parking and is within easy reach of Chiusi, Siena and Florence. The restaurant serves local cuisine. Breakfast includes homemade bread and cake. This property also has one of the top-rated locations in Acquaviva! Guests are happier about it compared to other properties in the area. This property is also rated for the best value in Acquaviva! Guests are getting more for their money when compared to other properties in this city. When would you like to stay at Relais Villa Grazianella? Air-conditioned room with a TV, a mini-bar, and a private bathroom with free toiletries. This suite has a four-poster bed, spa bath, mini-bar and air conditioning. This twin/double room has a view, mini-bar and air conditioning. House Rules Relais Villa Grazianella takes special requests – add in the next step! ATM card Relais Villa Grazianella accepts these cards and reserves the right to temporarily hold an amount prior to arrival. 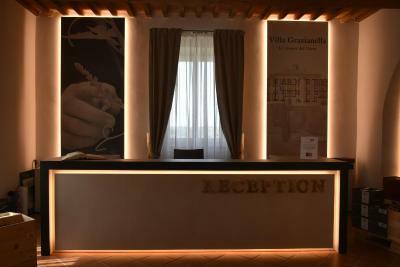 Relais Villa Grazianella accepts these cards and reserves the right to temporarily hold an amount prior to arrival. Please note, apartments are set 2.5 mi from the property. Please inform Relais Villa Grazianella of your expected arrival time in advance. You can use the Special Requests box when booking, or contact the property directly using the contact details in your confirmation. Everything was wonderful. The service was really friendly. The gave us a nice tour of the winery. Also dinner and breakfast was amazing. The place is absolutly beautiful and romantic. We used offline google maps and it was easy to find. Beautiful property in a lovely setting, clean and comfortable rooms, good food, excellent wine, friendly service. Amazing experience, great wine, wonderful hosts, breathtaking views! Small room for 3 people, a double bed, a single bed and luggage. Single bed very small for a 17 year old. Beautiful location. The food & wine was delicious. Wi-fi is extremely bad. Only in the lobby you have relatively good access, but still slow. Noisy rooms... If one room is awake on the same floor, everybody is. Although the owner is an insurance company, the staff that work there treat it like it’s their own. What an amazing and super friendly team, always helping you with a smile. Pool is awesome, rooms are very clean, breakfast is superb. Different kinds of yoghurt, fresh fruit salad, bread, cakes, muesli, cornflakes.. you name it! You can have a romantic sunset dinner outside. Their wine is in the top 5% best wines in the world, so make sure you buy some! We already recommended the estate to family & friends. Beautiful villa with breathtaking view on the Tuscany countryside and vineyards. Great and friendly staff. 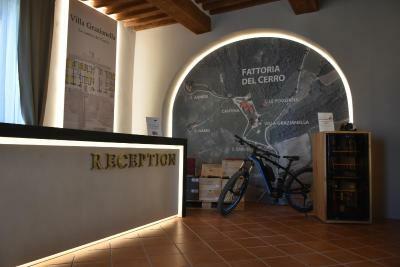 Wine shop for great wines produced at the location and other vineyards belonging to the Tenute del Cerro, all of high quality. Possibility for a wine delivery saving some weight in the luggage. Great breakfast and excellent local food in the restaurant, large and tidy rooms for accomodation. Guests sharing the pool are were a bit inconsiderate/ rude with loud talking and crying baby but that was not the hotel’s responsibility. We have just stayed at the Relais Villa Grazianella and can only say Wow! Our stay here was superb. We spent 4 nights at one of the apartments on the complex which had ample space for the 7 of us (4 adults and three children). My kids (aged 10, 8 and 6) also thoroughly enjoyed themselves with their highlight being the gorgeous swimming pool. We had two of our dinners at the hotel - the warm summer evening and the breathtaking views made for a memorable experience. I also have to say the staff here are fantastic- the hotel manager especially was always smiling and laughing and made us feel truly welcome. We loved everything about this place and would say it’s the perfect place to stay if you want the authentic Tuscan experience- I would love to come back again!! The meals in the restaurant were good quality local produce; but there could, perhaps, have been a little more variety. The staff were outstanding, extremely helpful. We loved being on a busy, highly thought of, wine estate. 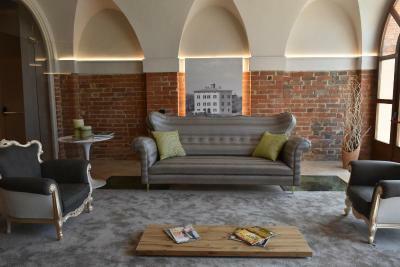 The hotel is an old mansion which has been done up thoughtfully to accommodate guests and customers doing wine tastings. Our room on the first floor had the most wonderful views. The swimming pool is beautiful, very well positioned and very clean.